Are you looking for new ways to repurpose content? Of course you are. We all want new ways to take advantage of the hard work we have already done. Would you believe me if I told you that you had a cornucopia of content that is just sitting there untouched? Well it’s true and I’m talking about webinars! Why Should You Repurpose Webinars? Webinars are made up of stats, real world examples, case studies and practical how-to advice, the bedrock of great content. 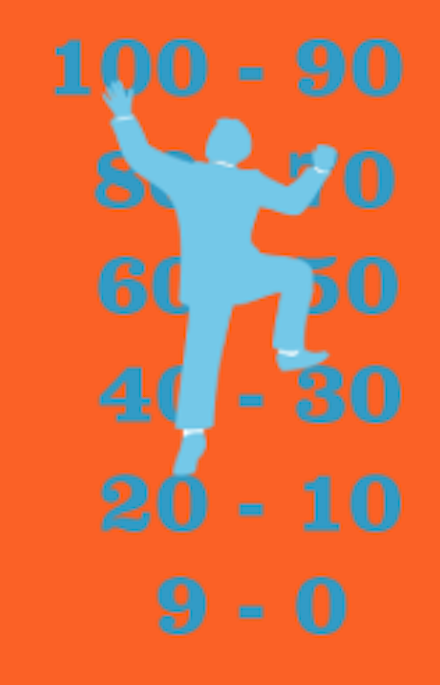 The average sixty-minute webinar is made up of 10,000 words; that’s a boat load of content. The problem is that most of us upload the webinar replays to our site, throw them behind a form and let them slowly disappear from the world. Today I want to inspire you to no longer overlook this wealth of amazing content! I’m going to show you how you can easily turn your old webinars that are no longer converting into AMAZING content by showing you an example of how we turned a stale two-year-old webinar into an exciting long-form infographic-like article in just a couple of hours. 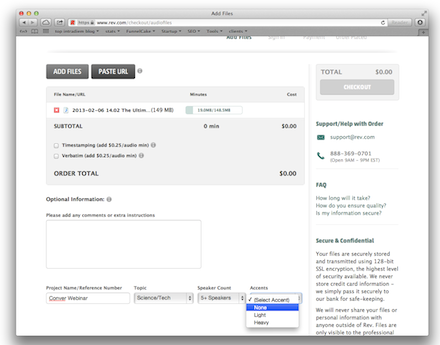 Transcription services make webinars so super simple to turn into articles. I simply upload the webinar replay file provided by the webinar hosting service to the transcription service and they are able to transcribe it quickly. 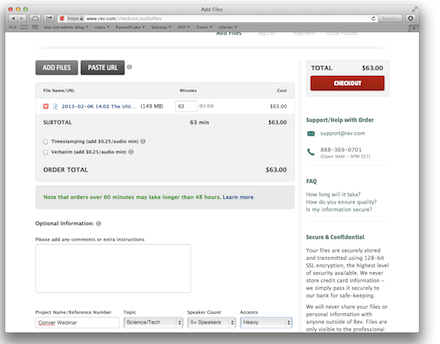 I like to use Rev because although they say it will take over 48 hours, they typically get it back to me the same day. Plus, it is only a one dollar per minute. Sign in to Rev.com and press the red Upload Files button. Find and choose the webinar file provided by your webinar hosting service. Optionally add additional details about your file. I recommend giving your project a name. It will make it easier to find which file you need in the future. 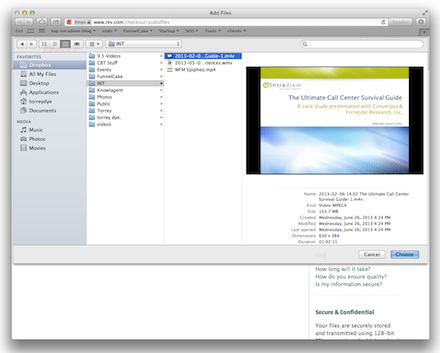 The easiest way to slice up the webinar is by speaker. If there is only one main speaker you will probably want to further divide the transcription. Begin cleaning up the transcription once you have the portion of the transcription you want to transform into an article. 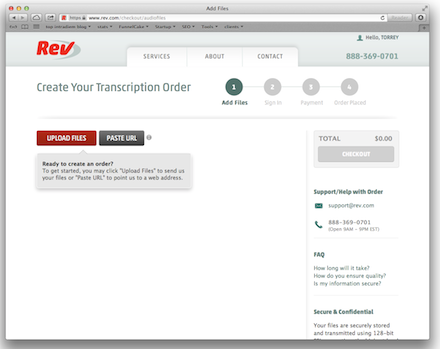 I was surprised at how little effort it takes to transform the spoken transcription into a pleasantly readable format. It does vary according to the speaker. The work of professional speakers who practice their presentation is super simple to transform. On the other hand, an internal product expert who may not be used to speaking may take a little more work. No, not really. One of the reasons why we’re having this webinar is this is a pretty hot topic. There was somewhat of rock star metric these days. Not only are two-thirds currently measuring it, but to see that another one in five are planning to in the near future, kind of is a testament to that. I’ll just start off and let’s really start talking about first call resolution, otherwise known as FCR, because there simply aren’t enough acronyms in our profession already. One really need only look at some recent research to understand the current excitement and buzz about FCR. For instance, a study conducted by a research and consulting firm, Customer Relationship Metrics, found that caller satisfaction ratings will be 35% to 45% lower when a second call is made for the same issue. That’s a pretty big finding right there. It’s a big impact on CSAT. Another study conducted by a service quality measurement group revealed that for every one percent legitimate improvement in first call resolution, you get a one percent improvement in customer satisfaction. Some will argue about that finding. In my experience, I’ve seen it to be quite the case, when people are measuring FCR correctly. In fact, the folks at Service Quality Measurement Group say that out of all the metrics in the context center, FCR has the biggest impact on customer satisfaction. Findings from a study on first call resolution that I conducted while I was with ICMI, not too long ago, further support this claim. 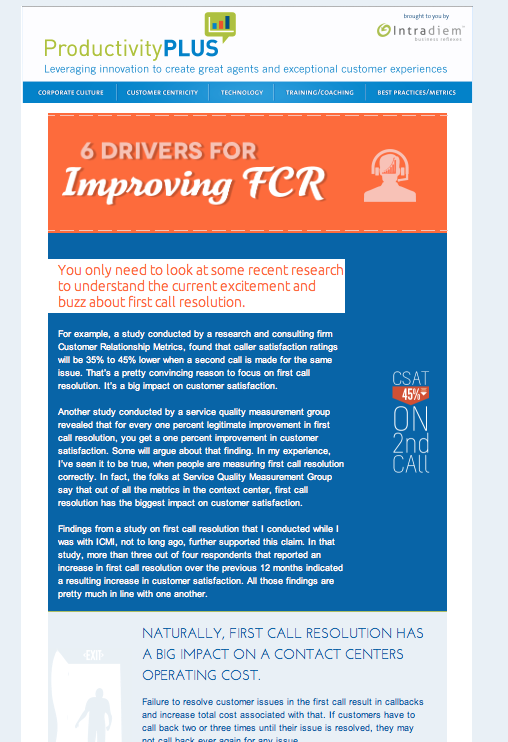 In that study, more than three and four respondents that reported an increase in FCR over the previous 12 months indicated a resulting increase in customer satisfaction. All those findings are pretty much in line with one another. 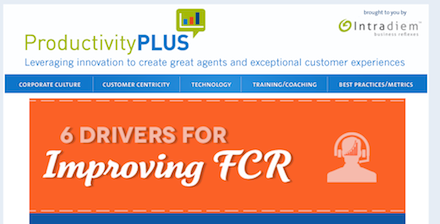 Naturally, FCR has a big impact on a contact center’s operating cost. Failure to resolve customer issues in the first call results in callbacks and increase toll cost associated with that. If customers have to call back two or three times until their issue is resolved, they may not call back ever again for any issue. According to Service Quality Measurement Group Research, 34% of customers who do not get their inquiry or problem resolved on the first call are likely to go to your competitors – one in three. In contrast, only three percent of customers whose issue is resolved on the first call are at risk of going to a competitor. One more thing: let’s not forget that FCR improvement generally also leads to happier agents who endure far fewer rants and insults from customers when issues get resolved promptly. I started cleaning the transcription up by first cutting the beginning portion where the speaker is responding to a question that the webinar host has just asked. I’ll just start off and let’s really start talking about first call resolution, otherwise known as FCR, because there simply aren’t enough acronyms in our profession already. Then I searched through the transcript for other areas where the host interjects with a comment, question or poll. Matt: Greg, before we do I just wanted to jump in here and remind our audience that if they’ve got questions, to enter those questions in the question panel, the question section on your screen there. We’ll get to those at the Q&A section at the end. Just to remind the audience of that. Also, we’re getting a lot of requests for the PowerPoint. The PowerPoint will be made available to everyone who registered. If you’re here today and didn’t register, there’s contact information at the end so you get the PowerPoint presentation. One really need only look at some recent research to understand the current excitement and buzz about FCR. I changed the beginning from “One really need only look” to “You only need to look.” I also changed the acronym to the full words for SEO. You only need to look at some recent research to understand the current excitement and buzz about first call resolution. 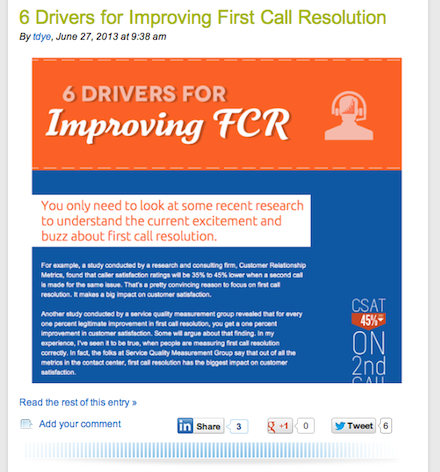 You only need to look at some recent research to understand the current excitement and buzz about first call resolution. For example, a study conducted by a research and consulting firm, Customer Relationship Metrics, found that caller satisfaction ratings will be 35% to 45% lower when a second call is made for the same issue. That’s a pretty convincing reason to focus on first call resolution. It makes a big impact on customer satisfaction. Another study conducted by Service Quality Measurement Group revealed that for every one percent legitimate improvement in first call resolution, you get a one percent improvement in customer satisfaction. Some will argue about that finding. In my experience, I’ve seen it to be true, when people are measuring first call resolution correctly. In fact, the folks at Service Quality Measurement Group say that out of all the metrics in the contact center, first call resolution has the biggest impact on customer satisfaction. Findings from a study on first call resolution that I conducted while I was with ICMI, not too long ago, further supported this claim. In that study, more than three out of four respondents who reported an increase in first call resolution over the previous 12 months indicated a resulting increase in customer satisfaction. All those findings are pretty much in line with one another. Naturally, first call resolution has a big impact on a contact center’s operations. Failure to resolve customer issues during the first call results in callbacks and increased total costs. If customers have to call back two or three times until their issue is resolved, they may not call back ever again for any issue. According to Service Quality Measurement Group research, 34% of customers who do not get their inquiry or problem resolved on the first call are likely to go to the competition. That is one in three. 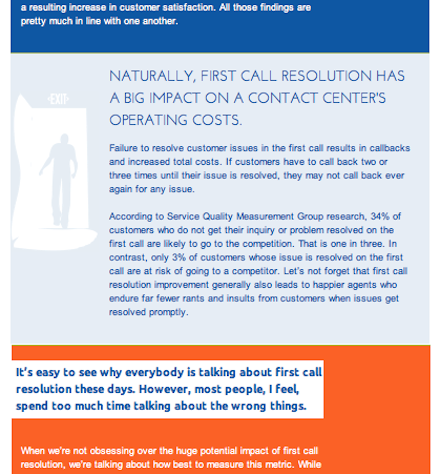 In contrast, only 3% of customers whose issue is resolved on the first call are at risk of going to a competitor. Let’s not forget that first call resolution improvement generally also leads to happier agents who endure far fewer rants and insults from customers when issues get resolved promptly. That text may be pretty boring to those of you who aren’t in the call center industry, but if you were in the call center industry and interested in first call resolution, it would be pretty compelling. The speaker/writer provides several stats, quotes studies and provides personal experience, and this is just a portion of the full article. The final article was around 2,800 words. Our goal was to have the article be over 2,400 words. Check out Neil Patel’s post, How Content Length Affects Rankings and Conversions, for a great explanation of why you should have web pages and articles over 2,400 words. Since this article was longer than we normally post, we wanted to make it even easier and more exciting to read. So, we designed it into a long-form, infographic-like article. I won’t go into the technical details of how I designed this page because that would bore most of you, but I will provide the thoughts and plans behind the structure of the page. I designed the title and top of the article to look very much like an infographic so that readers would associate the form of the article with an infographic. Next, I placed the text against colorful backgrounds to again look similar to an infographic but also to break the text up into easier-to-read sections. The first sentence of each section was designed differently than the rest of the text to pull the reader to the next section. The first sentence would be larger and a different color than the rest of the text. I placed an image in each section to make the article more visual. Each section’s background color was alternated to attract the reader to the next section and break the long text into readable sections. We decided to post the article on our blog. This was a bigger decision than you might think. Because of the nature of the long-form infographic-like article, we could have posted it to the resources section of the main site or on the blog as a post. In the end we decided that we would rather have it as a blog post because the article was written casually, we wanted the SEO juice to go to the blog’s sub-domain and we wanted the blog to have our best content so it would attract more readers. I explain this to you because if you create something similar, you will probably face the same decision, so I wanted to walk you through our thought process. We couldn’t make a WordPress post look like an infographic and had to have the page designed from scratch. This meant that the page itself would need to be outside of WordPress, but we still wanted it to show up on the blog. To make this work we uploaded the page to the sub-domain of our blog and used a WordPress plugin that redirected someone who clicked on the post link to the correct page. I will explain in further detail next. This is where you want to upload your article. 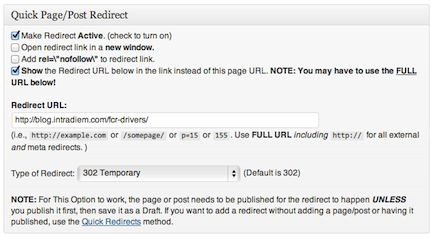 That way it will be sitting in your blog’s subdomain or URL, but not inside WordPress. I use Quick Page/Post Redirect Plugin to redirect. I’ll show you what I mean. I took a screen shot of the top portion of the repurposed webinar article and placed it in the post. I placed the following line, <!–more–>, below the image in the html text window of WordPress. This made the blog’s homepage only show to this point. Then under that I wrote the first paragraph of the article. No one would ever see this text in the post, but it would show up in a social media post when we or someone else shared the post on Twitter, LinkedIn or anywhere else. Then I simply checked the boxes for redirecting the post, showing the URL of the redirected page, and added the URL to be redirected to. Producing rich content is a challenge for most of us. Many of us B2B companies have been doing webinars for years, yet we have not been taking advantage of repurposing them. Getting your webinars transcribed provides you with a lot of articles and only takes a few hours to clean up, design and post. That’s far less time than it would take to write the same length article from scratch. Plus, webinars are chock full of stats and personal examples that make for great content. 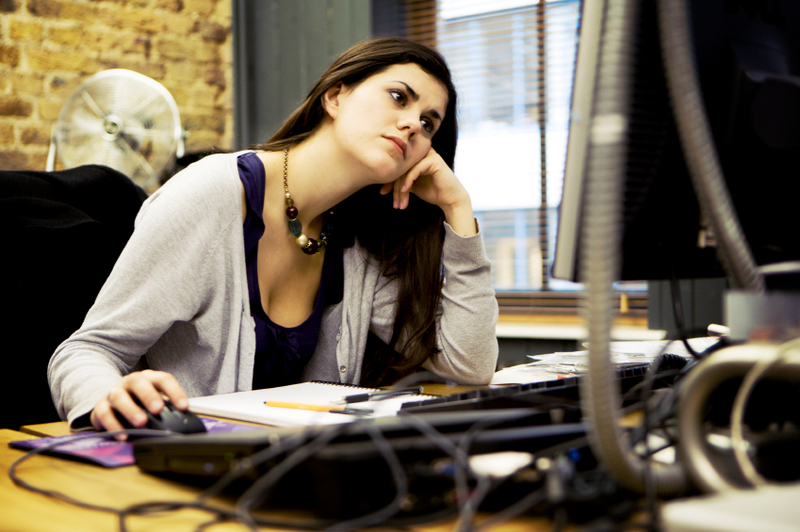 I hope this article has inspired you to start transforming your webinars! How else could you repurpose webinars?